June is here! and it only means one thing for us gardeners. Sowing season is starting. 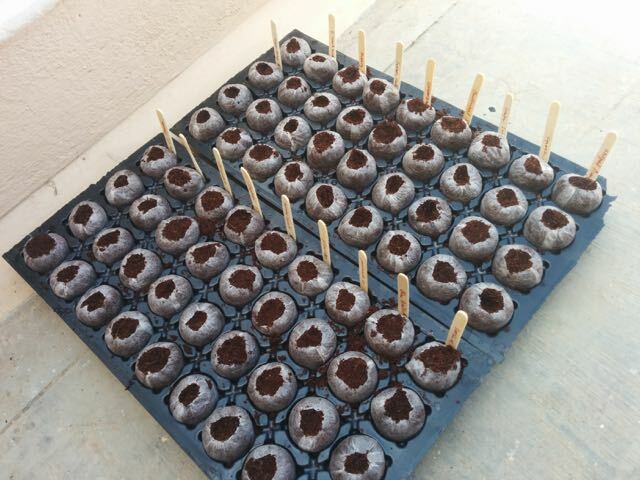 Although bangaloreans are lucky to grow p ractically anything round the year, for people in other states, we do need a vegetable seed sowing schedule. If you have bought the seeds but waiting for a “golden” time to sow them, then this is it! The time has come. We had nice showers today kickstarting the season. What are you waiting for? Get the seeds and start sowing. Please refer to Sowing Chart for more details. Yes You can reuse them. I also add some more compost and bone meal when I sow the next crop. Thanks for the suggestions . Can you pls tell me where I can get the seeds (Natti variety) broad beans ( avaraikai) and also the snake gourd (the long variety one gets in TamilNadu), in Bangalore? I managed to get the seeds of broad eans , which is bush variety, I am looking for the climber variety, which i think is also a perennial. Also, LalBagh seems to have the seeds for short variety of snake gourd, not the long variety. Another query on your post on growing Okra : Does okra plant require staking? I have some Avaraikai seeds the climber kinds. I got it from UP. and i kept trying to get a long 6ft snake gourd but in vain. I am on it and once i find any, will let you know. Okra plants don’t need staking actually since they have a very strong root system and their stem is very hard and sturdy. As they grow, the stem gets thinner and the leaves get narrower. I have some plants that are 5ft+ tall and still doing on. But if it is too windy and at a very high place. A stake will help the plant from not breaking down. This is my favorite blog,. I love your stuff. You always seem to be doing what I planned on doing in a month or so. I was delighted after visiting your blog. Have been an avid gardener. However, being based in Mumbai do not get enough space for plants. So, now, i am more interested in gardening for small spaces and keep experimenting with growing mediums like hydroponic balls, coco coir (Read abt your search for perlite in b’lore and could very well relate to it as I had searched for Hydroton balls here in Mumbai). For me, its always very exciting to find people who have similar passion for gardening. I am very much inspired by this blog and started growing vegetables in my kitchen garden. It was a great feeling to serve the pulao cooked using home grown french beans to my family. I didn’t find any other better place to share my happiness on that than this blog. Thank you. I have some tomato plants in my kitchen garden, all bearing good-sized green tomatoes for 10-15 days almost 50 in number now. When should they be harvested? No sign of them getting ripe. I plucked 1 of them, but that did not ripe even after 4-5 days. Please help. Thanks for your appreciation and for sharing your happiness with us. I can totally relate to what you are saying about serving the food with homegrown veggies. Another thing I have seen is, folks in my family don’t waste any veggie at all. They give more value to it. Don’t harvest the tomatoes when they are green, unless you want to cook green tomatoes. Leave them in the plant till the ripen. It will take some time, but they will turn red in the plant itself. It will be more tasty than plucking them green and ripening them off the plant. I’m a 15 year old girl who just started gardening as a hobby, and I absolutely LOVE your blog. Nice to know that you are starting gardening as your hobby. Trust me.. its gonna be fun!.. Thanks for great tips on what can be planted this month. I live in a small flat, which has lots of light and breeze. But there is no direct sunlight coming inside my flat. I would like to grow Ginger, Garlic, Pudina and Coriander on my small balcony. Kindly give specific tips on how to grow these 4 plants in small containers since i have a space constraint, and place which has no direct sunlight. Ginger you can plant the rhizome and it will send out a shoot. Use a loose medium with cocopeat/sand. Same applies to garlic as well. They do moderate in low sunlight. Hello, I am so glad I could find someone to look for advices. I have grown some tomato and chilly. It seems the leaves are getting black spots at the back of the leaf. I love your blog. I want to know how to setup soil for a rooftop garden and vegetables that can be grown in a climate like Chennai. Recently a week back sowed chilli seeds in a pot still waiting for it to sprout. I am not sure about the depth at which the seeds should be sown. In Chennai where can I get good variety of seeds and material to set up a good roof top garden. Thank you for this wonderful blog !!! I am a beginner gardener from Hyderabad. It is still very hot outside so I am not sure if I can start sowing few seeds as per June schedule. Kindly suggest. Also any idea in HYD where I can get seeds,coco-peat? Hi, I see that you don’t have lemon or lime on any of your sowing charts or posts. Could you write a post on growing lemon or lime at home? Hi, can anyone advise on the fertilizers to be used. The project is more of hobby and on experimental basis near Delhi. Using Drip system and plants have been placed on the bed, now around 7 days. What all fertilizers are now required ahead for good fruit.